Incumbent State Sen. Janet Bewley, left, and challenger James Bolen. Candidate photos courtesy of their campaigns. A northern Wisconsin race is pitting the Democratic incumbent against a Republican in his first run for state Senate. A Republican businessman and long-time Chamber director from Cable is making a run for the 25th Senate District seat during a time when many Democrats feel they’re riding the "blue wave." The 25th Senate District has been a Democratic stronghold for decades. 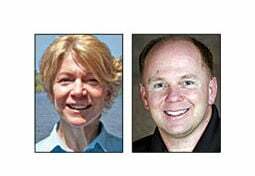 Former state Sen. Bob Jauch, D-Poplar, served in the position since 1987 until he retired, and Janet Bewley, D-Mason, beat out Rice Lake Republican Dane Deutsch in 2014 for the vacant seat. Voters in the district may have elected Democrats to be their voice in the state Senate; however, the majority of them — 51.9 percent — also cast a ballot for President Donald Trump in the last presidential election, according to figures from the Wisconsin Elections Commission. Now, Cable tourism official James Bolen hopes to unseat Bewley. The two differ on issues like Foxconn. In a debate on WPR’s "The West Side," Bewley said state lawmakers are diverting money away from northern Wisconsin and putting it "straight to Foxconn and straight to all of the expenses that are related to it being created." Bewley cited lawmakers’ approval of more than $20 million for construction of a road project to serve the plant that would be built by the Taiwanese company. "By snapping their fingers, $20 million of your tax money went to Foxconn for access for roads, and those are the kind of decisions that bleed northern Wisconsin of the money that should be returned to them," Bewley said. Bolen argued Foxconn would add $51 billion in economic output to the state, citing figures from an analysis by the Metropolitan Milwaukee Association of Commerce. "That is definitely helping the overall economy and helping to make more revenue available for some of these projects," he said. "You don’t do any favors by vilifying the fact that Foxconn is coming in." The Republican challenger also noted that roughly $3 billion in state incentives were not given to the company upfront. "They have to generate the 13,000 jobs and all of those things so there’s a good benefit there," he said. "But, I think it’s also important to also look at the issues that we’re facing here in northern Wisconsin and how we can better discuss making sure that the funding that comes to the north comes to the north." The two also disagreed on ways to fund transportation in the state. Bewley has said she would support raising revenues to pay for road projects. "Unless we get a good source of revenue into transportation, we will always have this problem," she said. "Our secretary of transportation said that we have a spending problem in transportation. We do not. We have a revenue problem." Bolen said he would not likely favor raising taxes for transportation funding. "Especially gasoline taxes until I can see a little bit better what exactly they’re looking at, where the funding is going to go," he said. The two also discussed their views on sulfide mining, chronic wasting disease and wolf management. They will face each other in the November general election. Wisconsin Public Radio can be heard locally on stations KUWS-FM 91.3, WUWS-FM 90.9, WSSU-FM 88.5, WHWA-FM 104.7 and WHSA-FM 88.9. Rain likely. High 44F. Winds ENE at 15 to 25 mph. Chance of rain 80%. Rainfall near a quarter of an inch.. Rain likely. Low 39F. Winds ENE at 15 to 25 mph. Chance of rain 90%. Rainfall around a quarter of an inch.